Today, the Half Cent Coin remembers the news of 200 years ago with two articles from the American and Commercial Daily Advertiser of March 18, 1816. The first story came from one of their customers in the form of a letter to the editors. The second came from the Gazette and followed a similar theme. The liberal and enlightened best know how to make money; and such are never slow to appreciate and reward the meritorious. A few nights since we were alarmed by the cry of fire! and such of us who hastened to the relief of our suffering fellow citizens were distressed at the ravages of this element. But we enjoyed in no small degree the luxury of beholding a Juvenile Band of worthies exerting, gratuitously, all their energies in preserving the adjacent buildings. A youthful society, the Washington Hose Company, could not fail to attract the notice, as they challenged the admiration, of the feeling observer. They are happily designated Washington Company; for the luster and glory of that great man is well emulated by all sincere and active philanthropists. The writer of this note witnessing the laudable zeal and usefulness of the company here mentioned, was gratified in proportion as he knew that their benevolence was disinterested. He recognized in the ranks of their members mostly the sons of very respectable parents, not a few indeed of the most respectable young gentlemen in the city. And the writer was somewhat stimulated to this public notice on learning that the City Council when recently applied to, had not funds to spare for the purchase of a Suction Engine for this company, which renders a subscription necessary. Some of the Members will wait on a few of the liberal and enlightened citizens, for the purpose of soliciting some pecuniary aid in order to be more extensively useful. Such citizens by that giving, will perhaps consult their own aggrandizement. This very company may save your house. To save is to make money. FIRE —On Friday night, between 11 and 12 o’clock, a small wooden building on the North side of Market Street a few doors east of Calvert Street was discovered to be on fire. Although the assistance of citizens, particularly the members of the fire and hose companies, was promptly exerted as usual—the flame soon communicated to the adjoining buildings; the house to the east occupied by Mr. Levy Solomon, the upper story being of wood, was almost wholly destroyed; some part of its contents, particularly of the hardware in the store was saved by the exertions of the citizens. A brick house occupied by Mr. Alexander Coulter, adjoined the building in which the fire originated on the west; the roof of Mr. Coulter’s house was much damaged, and his goods and furniture, although saved from the fire, were necessarily injured by the removal. It is supposed that the fire was accidental. —Gaz. 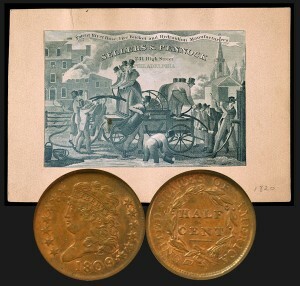 The Half Cent Coin shows with an image of firefighting equipment, circa 1817.